樂very interesting on how two motors are the same cubic inch basically but have two different configurations and the valve events to be different from one another. The Lingenfelter cams use some brutal lobes... LSK. They make insane power. But you have to build the rest of the valvetrain to support it. Lingenfelter sells Ferrea valve springs to support the LSK with the LS7 1.8 rockers. But the Thunder Racing cam was designed for use with stock manifolds. So you had nothing helping the engine breathe on that side. I didn't know that about this cam, thanks for the info. I had considered it since its actually available off the shelf down here but with those lobes it won't work for me. Tick Performance used to make a cam close to the 218/230 .612"/.595" 115+4 you recommend. It was a 218/230 .595"/.609" 117+2 but no longer appears on their website. All except the last two are more difficult to get and more expensive to buy and have tuned down here so if that's the path I take I want it to be right (I have priced up the CamMotion but didn't pull the trigger). Anyway, im probably taking this excellent thread off track. Thanks for the advice you have provided. No worries Pulse Red! More good info is always welcome! I think I'm a bit confused. I think I understand the concept of overlap. a positive overlap allows for high end power, Low or negative overlap enhances power in the low RPM range, adds low RPM torque but limits top end. A popular Speed Shop with their own branded Cams advertise a 224/224 600/.600 available in a 114 and 112 LSA. They add comment " The 112 LSA helps to bring the camshafts power band lower in the rpm band. The lower LSA also creates a slightly rougher idle". Wouldn't the -4 (114 LSA) result in more low end performance than an overlap of 0? Last edited by Bossdog1; 09-28-2017 at 10:22 PM. That would be correct. By lower in the RPM band I think he meant lower in the mid range band. As far as off-idle, the 114 LSA would be more responsive than the 112 LSA. Unfortunately, none of this is correct. For starters, the LSA does not determine how early the powerband comes in or how high it carries. LSA itself does not mean anything. This is a myth that will not die. But, there is a reason that LSA gets confused in this way. Here is the reason: both the intake lobe and the exhaust lobe have a centerline. A typical example of this is a camshaft ground on a 112 degree LSA. On an LS engine, this camshaft will also typically have about 2 degrees of advance ground in. This means that this camshaft will have an intake centerline of 110 and an exhaust centerline of 114. This is where LSA comes from. You add those two numbers together and divide by two. That is literally all that LSA represents. Here is where the confusion comes in. The number one determining factor on the engines power curve on a given duration camshaft is the INTAKE CENTERLINE. The more advanced the camshaft intake centerline (and the lower the ICL value) the earlier the power will come in. And, the later the ICL (larger the ICL number) the later the powerband will come in. Again, it is the ICL not the LSA. With that said, the intake centerline or ICL is one of the two numbers and comprise the lobe center angle or LSA. So, a lower ICL will affect the LSA number. But, because the LSA is comprised of two numbers, you cannot count on the LSA alone. In this example, you have two camshafts with identical intake and exhaust durations. However, one has a 110 degree LSA and the other a 112 degree LSA. The LSA's are circled in orange. Of these two camshafts, the 112 LSA camshaft will have the have more peak torque and have an earlier (lower RPM) horsepower peak than the camshaft with the 110 LSA. This is exactly the opposite of the LSA myth. Why? It is the intake centerline. Notice the numbers circled in green. Even though the one camshaft has a 110 degree LSA, it also has a 110 degree ICL. However the wider LSA camshaft on 112 has an ICL of 108 degrees. That is because the 112 degree camshaft has more "advance" ground in. This is the perfect illustration why LSA is not a good indicator of powerband. LSA does not take "advance" into consideration. LSA does not communicate lobe centers at all. It merely communicates the two lobe centers relationship to one another, not where the lobe are centered. And, where lobes are centered is what determines valve events and thus powerband. If you really want to understand what is going on, download this calculator and start experimenting with the numbers. You will learn quickly that the LSA alone means nothing. 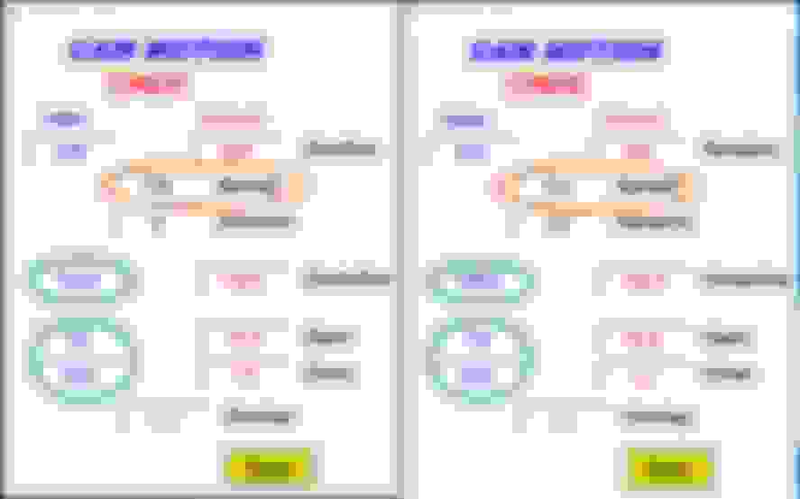 We also tend to talk about overlap with an @.050" number when advertised duration and flank speed can manipulate the hell outta the overlap scavenging effect. Even my old EPS 117 LS(-12 deg @.050 OL) cam changed idle sound when I went from shorty headers and four cats to long tubes and big 3" cats......indicating that a generally regarded wide lobe separation does still have overlap. The old Geoff Skinner lobes were 49 degree intensity and I have no idea if they were asymmetrical or not in shape. Thank you for the excellent summary of the info from the beginning of this thread. So if i understand, the lower the ICL, the sooner the power increases in the RPM range. The example on the #1 post uses the example of the following cam, describing it as a "top end screamer"
234/242 111 +3 advance. In this case the ICL is 108, with an overlap of +16, and is described as a "high end screamer". The large duration numbers and large overlap would indicate a "high end screamer", to me. the 108 ICL would indicate the opposite??? In the initial post he indicates a large overlap # pushed the power higher into the power band and a low or negative overlap number is low end torque. I am looking for a cam with as much power in the low end the the power bans a possible, I rarely exceed 6000 - 6200 rpm. They are still available from Comp as LSG lobes.. 49 degree intensity. But they were based on the LSL lobe. So very similar... but more aggressive off the seat with a tad less curtain area with a little less lift. So, in essence, a more stable, XE-R asymmetrical lobe. I'm running LSL now and it's a very good lobe. I would almost recommend the LSG over it, though. LSG/XE or LSG/LXL would be a very good combination from Comp. That is correct thinking. As the durations get higher, this will move the RPM range higher. However, more advance, or a lower ICL tends to move the RPM range lower. It is not uncommon to see a larger duration camshaft that is very advanced and is a narrow lobe separation angle. These type camshafts tend to have a lot of overlap and are typically naturally aspirated racing camshafts where no concession are made for drivability or low RPM operation. 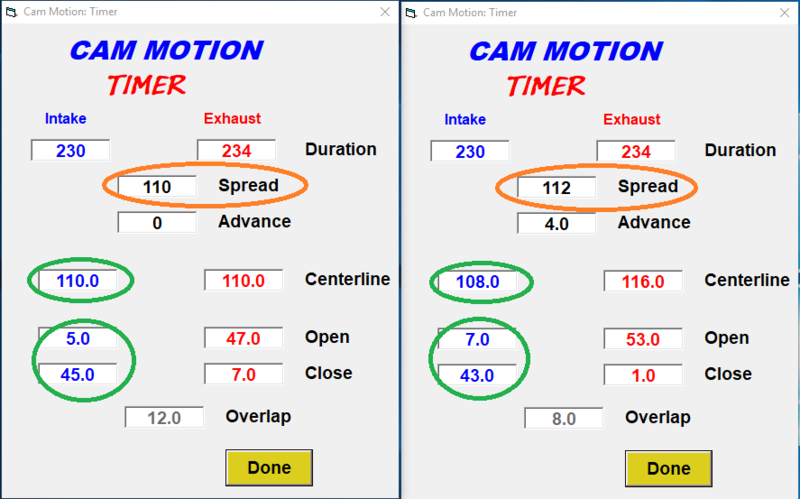 If you notice in the example I gave above, The Cam Motion Cam Timer displays the 4 valve events. I tend to look at the 4 valve events more than anything. So my criteria is more like IVO (intake valve open), IVC(intake valve close), EVO(exhaust valve open), EVC(exhaust valve close), Overlap and lift. 224/230 duration on a 111.5 degree lobe separation with 3.5 degrees if advance and .621"/.604" lift. This camshaft would have a mild lope and idle and excellent torque and acceleration to 6200 RPM. It will also have a very tractable power band that will be strong and predictable. This is a custom camshaft. I work at Cam Motion and we make a custom camshaft like this at no extra charge. So, you can get exactly what you need. can someone please post a link to Martin's thread (I am having trouble searching, it never completes). Last edited by joecar; 10-05-2017 at 11:50 AM. I now remember reading it back then, it's very educational and thorough.